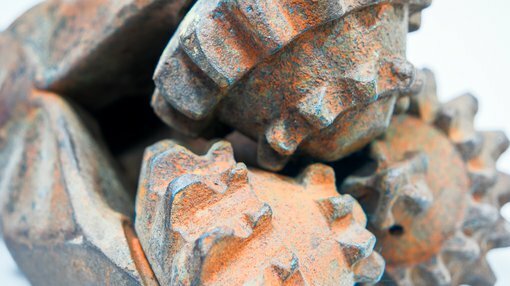 White Rock Minerals (ASX:WRM) today announced that two of the first three diamond drill holes have intersected massive sulphide mineralisation at its high-grade zinc VMS project at Red Mountain in Alaska. Drilling at Red Mountain kicked off in May. This project contains polymetallic VMS mineralisation rich in zinc, silver and lead, as well as potential for significant gold and copper. Mineralisation occurs from surface and is open along strike and down-dip. At the Dry Creek deposit, the first drill hole (DC18-76) intersected a zone of massive to semi-massive sulphide with coarse sphalerite and galena from 63.9 to 72.7 metres (8.8m) downhole (estimated true width of 7.9m). This hole is some 20 metres from the nearest holes (DC97-33 and DC98-39). At West Tundra, on the other hand, the second drill hole (WT18-28) intersected a zone of massive to semi-massive sulphide with visible sphalerite and galena from 60.6 to 63.1 metres (2.5m) downhole (estimated true width of 2.5m). This hole is around 75 metres from the nearest drill hole (WTF82-05). The first drill hole (WT18-27) drilled down a steep angled fault and did not intersect any significant base metal sulphide mineralisation. Mineralised intervals have been split, sampled and submitted to ALS laboratories for analysis of gold and base metals. WRM said it expects results back in late June. “This programme is the culmination of two years’ work, analysing the existing data, identifying 30 high priority exploration targets, expanding our strategic footprint ten-fold, producing a maiden high-grade zinc–silver JORC Resource, and then tendering and awarding a number of contracts for the camp, diamond drilling, on-ground reconnaissance crews and supporting services,” added Gill. The Red Mountain Project is situated in central Alaska, 100 kilometres south of Fairbanks, in the Bonnifield mining district. WRM’s tenement package comprises 230 mining claims over a total area of 143 square kilometres. 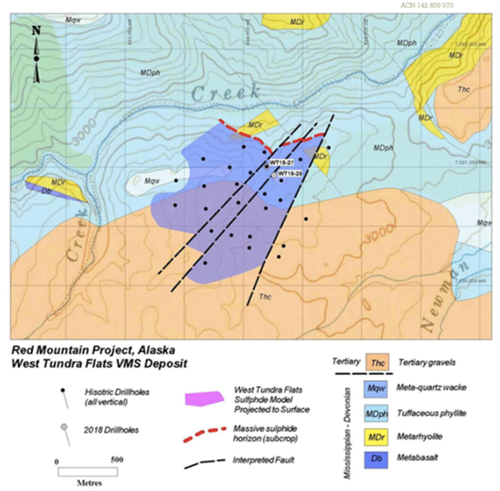 As announced back in April, WRM used historical drilling to determine a maiden JORC 2012 Mineral Resource estimate for the Dry Creek and West Tundra Flats deposit. The Inferred Mineral Resource contains an impressive base metal and precious metal content with 678,000 tonnes zinc, 286,000 tonnes lead, 53.5 million ounces silver and 352,000 ounces gold. The project has seen good preliminary metallurgical recoveries of more than 90 per cent zinc, 75 per cent lead, 80 per cent gold, 70 per cent silver and 70 per cent copper. Interpretation of the geologic setting indicates conditions that enhance the prospectivity for gold-rich mineralisation within the VMS system at Red Mountain. Gold mineralisation is usually found at the top of VMS base metal deposits or adjacent in the overlying sediments. Gold bearing host rocks are commonly not enriched in base metals and consequently often missed during early exploration sampling. This provides WRM with an excellent opportunity for potential further discoveries. WRM sees significant discovery potential here, especially given the lack of modern-day exploration. This is further enhanced by the nature of VMS clustering in camps and the potentially large areas over which these can occur.